New Zealand has salvaged some pride in the final test match, romping home 34-nil in front of 32,186 fans at Elland Road tonight. England retain the Baskerville Shield, 2-1. It was a professional effort from the touring side. Six tries split in each half, and the rout was directed well by Broncos halfback, Kodi Nikorima. The half scored a four-pointer and had a hand in several others, to salvage some pride for the Kiwis, after two uncharacteristic displays in the first two tests. From the opening set, the Kiwis were switched on. The forwards rolled downfield easily then the suffocating kicking game from Shaun Johnson pinned the talented back three of England right on their own line. 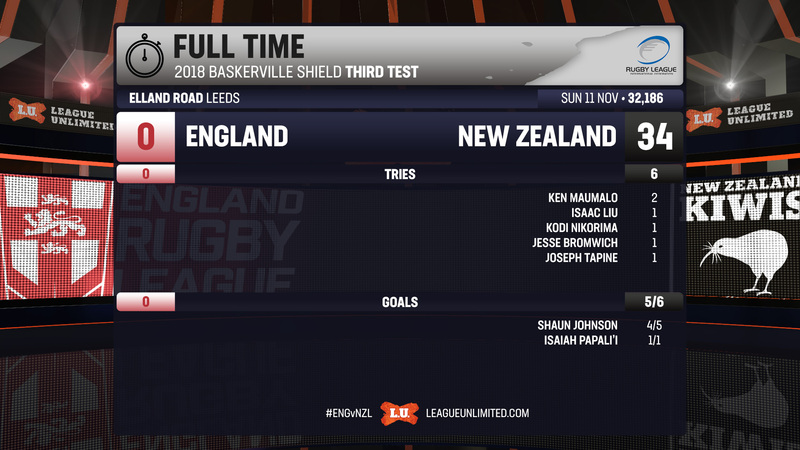 Once the opportunities flowed, the Kiwis showed their class as they took their chances to stun the Elland Road crowd in the first half. Ken Maumalo showed his full range of skills, burrowed over for the opener then rose like a spawning salmon minutes into the second half to snuff out any prospect of a comeback at 22-nil. New Zealand piled on some late insurance with Joseph Tapine and Jesse Bromwich ran decisive lines to cross almost untouched. Quite rightly, the plaudits from the game go to Nikorima. Two superb short passes - firstly for Isaac Liu then Jesse Bromwich late in the piece - then the highlight piece, a slicing run that made it 18-nil at the break. Tonight represented a coming of age at international level for the Broncos half, usually played second fiddle to Johnson at this level, controlled the attack tonight. That said, it was like Al Pacino said in Any Given Sunday "a game of inches". Three times England had the ball across the stripe, all to be denied by the video official. Only the first seemed to be a marginal decision for obstruction, as the slick attack from the first two tests was missing from a much changed English line-up. Importantly, they retain the Baskerville Shield and will take plenty from this test series as they embark on a GB Lions tour downunder in 2019, quickly followed by a return of the Ashes the year after.